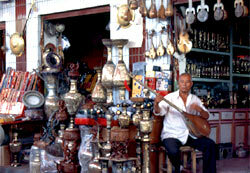 The Great Silk Road is a unique phenomenon in the history of mankind, with its aspiration for unity and cultural values exchange, its conquests of lands and monopolization of the markets. They say in the orient, “A sitting man is like a mat, a walking man is like a river”. Life is motion, and traveling, perceiving of outer world have always been the driving force for progress. This most important in the human history transcontinental trade route, that linked Europe and Asia, in the bygone days stretched from antique Rome to Nary, the ancient capital of Japan. Evidently the trade between the East and the West was conducted from the time immemorial, but several separate land tracks of what later became known as the Great Silk Road were used. The emergence of trade relations was much challenged by the exploitation in the mountains of Central Asia of semi-precious stones deposits – lapis lazuli, jade, cornelian, turquoise. These stones were highly valued in the East. Thus there existed a "lazurite" road, along which lapis lazuli was delivered from Central Asia to Iran, Mesopotamia and even Egypt. Concurrently, there developed a "jade" road which linked Khotan and Yarkend with the regions of Northern China. Besides, to the countries of eastern Mediterranean the ancient merchants delivered cornelian from Sogdiana and Bactria, and turquoise from Khorezm. All these routes finally formed the Great Silk Road. The area along the caravan trails in Central Asia has been a hotly contested region. Already in the middle of the first millennium B.C. the Persian rulers levied tributes on their vassal territories in Sogdiana and Bactria. The troops of Alexander the Great were the first to open the route from Europe to Asia in the 4th century B.C. Together with the warriors there moved eastwards the merchants who transported various goods to the remote lands and who brought back to their native countries a great deal of wonderful things. From Asia Minor and Arabia to the banks of the Yangtze the vast territory was intersected by trade routes along which there sprang up, prospered and went into a decline or vanished under the attacks of stronger conquerors many kingdoms and states. But trade caravans kept laying new routes. In the 1st-2nd centuries B.C. Roman senators and noblemen preferred to wear silk togas. So it was no wonder that Sogdian enterprising merchants established several trading posts along the roads heading toward China - in Kashgar, Yarkend, Khotan. Here at the thriving markets they met the caravans from China and bought from them longed-for silk and superfine China porcelain. 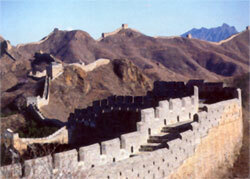 The Chinese tradesmen did not dare traveling further to the lands beyond these trading posts. The great overland thoroughfare that put together a series of caravan trails heading from Central Asia to the West and to the South and the paths leading from China to Eastern Turkestan, originated in the mid-second century B.C. when the Chinese for the fist time discovered the territories lying beyond the western borders – the countries of Central Asia. Retreating for a long time from the western world China itself opened its “door to the west”. In 138 B.C. Chinese emperor Wu Di of the Han dynasty sent an emissary, experienced commander and diplomat Zhang Qian, on a secret mission to Yueh - chi tribes in quest of an alliance against the disruptive Xiongnu. Zhang Qian presented to the emperor the results of this travel in his report called “ The journey that is 25 thousand li long ”. In his report he suggested a thorough plan of developing the relations with the western countries, the plan that soon was put into operation. Thus there met two branches of the great transcontinental road: the trail heading east from the Mediterranean world and the one heading west from the Hun Empire. It should be noted that there was never a single, static Silk Road, but rather a network of various routes which forked and branched like a big tree. The principal branch traversing Asia from East to West originated in Changan, an ancient capital of China, skirted the Gobi desert up to the north-western borders, across the Tarim Basin and further across Eastern Turkestan. Passing through the Tien Shan some caravans continued their way via the Ferghana Valley and Tashkent oasis to Samarkand – the capital of Sogdiana, to Bukhara, Khorezm and further to the Caspian Sea. From Samarkand a number of caravans headed for Bactria and crossing the Kashkadarya valley reached Termez where they got across the Amudarya river and headed further south to Kabul and India. Another branch of the road skirted the Taklamakan desert in the south and via Khonan and Yarkend headed to Bactry (northern Afganistan) and Merv and then through Persia and Syria reached the Mediterranean coast where by maritime routes some goods were delivered to Rome and Greece. As seen from the name of this transcontinental thoroughfare silk was the main article of trade. 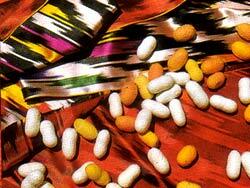 Silk was highly valued both in the East and in the West. In early Middle Ages it used to be the most popular unit of payment, actually making gold be withdrawn from circulation. Thus in Sogdiana the cost of a stallion equaled the cost of ten lengths of silk. Silk was used as payment unit for the works done, as mercenary’s salary; it could be also used to pay off the punishment for the committed crime. The name “Silk Road” was originally given to caravan tracks by Marco Polo, a Venetian merchant who was the first European to reach as far as Chinese empire. The term “the Great Silk Road” was coined for the first time by the German geographer Ferdinand Richthofen in his basic work “China” . 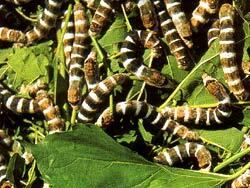 It is said that the Chinese were the first to discover the silk production from silkworm five thousand years ago. For a long time they held a monopoly for silk supply in the international markets. But in the 6th century a vagrant monk smuggled to Constantinople a silkworm grain hidden in his hollow walking cane. Thus the long-kept Chinese secret was revealed and silk began to be produced in Byzantium, Syria and Central Asia, particularly by Sogdians who traded domestically manufactured silk alongside with the one brought from China. In the 20th century in Notre Dame Cathedral situated in a small Belgian town of Huy there was found a piece of goldish patterned silk cloth decorating the sepulcher of Saint Dominician. The research proved the cloth to be called “zandanechi” and to be manufactured in the 6th-8th centuries in a remote settlement of Zandan in the vicinity of Bukhara. Sogdian silk was widely used for decoration of the relics of Christian saints in many cathedrals of France, Italy, Germany. 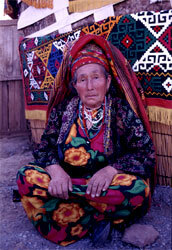 “Zandanechi” silk was also found in the burials in Northern Caucasus. Though being the main article of trade silk was not the only goods that was conveyed along the transcontinental road. Central Asia exported horses highly valued in China, arming, gold and silver, gems and articles made of glass, leather and wool, carpets and cotton, exotic fruits – watermelons and peaches, fat-tail sheep and hounds, leopards and lions. To balance the trade from China there came caravans loaded with porcelain and bronzes, lacquerware and perfumes, tea and rice. In merchants bales one could find tusks of the elephant, the horn of the rhinoceros, tortoise-shell, spices and many other exotic things. In the old days traveling involved risks that each merchant had to consider. The road itself was often far from being smooth and scenic. Generally it ran across deserts dotted with camel’s skeletons – sinister milestones of the paths. Freezing cold in winter and unbearable heat in summer. Agonizing thirst and frequent lack of water. Constant anticipation of blinding storms rivaled only by possible conflicts with nomads. Sporadic towns, oases where extortion was more frequent than hospitality. And on the top of all these hazards that travelers faced there was a constant threat of attack from brigands who plagued the caravan routes. But the fabled Silk Road was not a mere channel of trade: it was the means of propagation the cultural achievements of the peoples, spiritual wealth and religious doctrines. Ancient Zoroastrian cults prevalent in Khorezm, Sogdiana and Bactria, were replaced by Buddhism which became the main religion of the mighty Kushan empire and expanded to China. 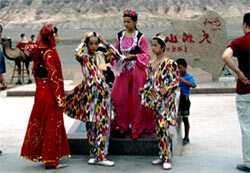 At the beginning of our era, from Asia Minor, Christianity eventually reached Central Asia and China via the Silk Road. In the 8th century the rigorous warriors of Arabia brought Islam to the eastern lands. In the later period the hordes of Genghis Khan rushed from the Mongol steppes to the European plains following the tracks treaded out by tradesmen and missionaries. From Samarkand - the city situated in the very heart of the Great Silk Road - Tamerlane, the great commander of the Middle Ages, started his military campaigns . For centuries travelers and pilgrims, scholars and explorers journeyed along the caravan roads. The Chinese monk Xuan Zang, the Venetian merchant Marco Polo, the Arabian missionary Akhmad ibn Fadlan and Bavarian warrior Shiltberger, the explorer from Hungary Armin Vamberi and Swedish geographer S. Hedin, Russian scientist Alexey Fedchenko and Swiss journalist Ella Maillart, US geologist Rafael Pampelli and French traveler Joseph Martin - this is but a short list of travelers whose travel notes and scientific proceedings make it possible to learn much about the history of countries lying along the Great Silk Road, the traditions and customs of people inhabiting these countries. Ancient Uzbek cities such as Samarkand, Bukhara, Khiva, Shakhrisabz, Termez, whose stunning architectural monuments bear the marks of centuries-old history of the Silk Road, are too, the living memory about the peoples who laid this unique overland highway from East to West.